Kuala Lumpur, being the capital city of Malaysia, has the most number of bus terminals in Malaysia. Last time, Pudu Sentral (or Pudu Raya) is the main and the only bus terminal in Kuala Lumpur and it was used to serve for coaches departing to and arriving from all parts of Peninsular Malaysia. However, with growing number of commuters as well as express bus companies, they have caused heavy traffic in Pudu Sentral area. To ease the traffic congestion in Pudu Sentral area, the authority has built more bus terminals in Kuala Lumpur, namely Terminal Bersepadu Selatan, Duta Bus Terminal and Pekeliling Bus Terminal. These 4 main bus terminals, each serves customers going to the North, South and East coast of Malaysia. Puduraya Bus Terminal – Puduraya Bus Terminal was closed in 2015. However, some bus operators still provide certain bus services in Puduraya Bus Terminal such bus to Genting Highlands and to the airport. Lot 1B Shoplex at Mont Kiara, expatriate gathered neighbourhood area. Kuala Lumpur being the largest city and having the most bus terminals in Malaysia, you can find almost all bus services to every part of Malaysia. The most popular service routes are coach from Kuala lumpur to Singapore, coach from Kuala Lumpur to Melaka, and coach from Kuala Lumpur to Penang. 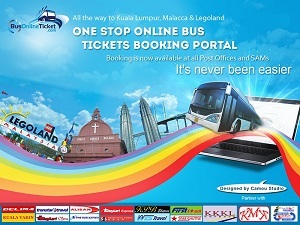 Online booking is available for most Kuala Lumpur departure routes. For airport shuttle bus service, you either go to Pudu Sentral to take Star Shuttle or go to KL Sentral to take airport buses like Skybus and Aerobus. Please take note, only Star Shuttle is providing shuttle bus service from KL to KLIA.